Medicine Balls for Beginners - Abs and Lower Body Workouts - Eat. Move. Hack. The secret to getting great results with medicine balls for beginners is to develop a passion for using this remarkable piece of exercise equipment. Using it can prove more powerful at blasting away fat while increasing muscle tone than many of the workouts popular with those on this level. It’s therefore worth being the foundation of your fitness program. 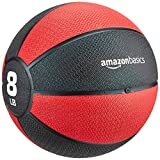 Since this is a ball, users can take on moves that simply wouldn’t be the same if done with dumbbells or resistance bands. Since the ball is weighted, it helps build muscle faster, and burns fat. The challenge created in using this unique piece of exercise equipment can give you an amazing workout overall and expedite the results you get. What better place to start than with the abs? For many the midsection is a problematic spot that’s resistant and stubborn. Yet having flat abs is a sign of great fitness. Medicine balls are one of the best pieces of equipment you can use to tone your abs because of their weight and the fact that they can easily be used with ab moves you may already be familiar with. But first, one word of caution; make sure the medicine ball you choose for this move is challenging but not too heavy. Otherwise, injury could result. The simplest medicine ball move for abs is the standard crunch. Laying on your back with your knees bent and your feet on the ground, hold the medicine ball above your chest and crunch upwards. Now, to target your lower abs place the ball between your bent knees. Use your thighs to press against the ball and hold it in place as you bring your knees in towards your chest. If you’re one who cannot manage doing abs on the floor, then try using the medicine ball to do standing abs. One move is simply to hold the ball out in front of you with both hands and control your movements as you twist your upper body left and right, keeping your lower body in place. Another standing medicine ball abs move is to hold the ball straight up in the air, take a wide stance, then alternate your knees, bringing them one at a time up towards the opposite shoulder as you bend your elbows and bring both hands and the ball towards the knee. Squats make perhaps one of the most recognized and simple workouts with medicine balls for beginners. A great thing about this move is how much variety you can add to it. Just combining squats with a few arm and knee moves can give you a challenging full body workout – especially when you factor in the weight of the ball. Still, the primary focus of this move is the lower body. Stand with your feet shoulder-width apart as you hold the medicine ball. Bend your elbows and raise them to shoulder height. Then, simply squat up and down. To work your abs as well, just from the waist to the left and right when you reach the top. Another great lower body move to do with a medicine ball is the glide lunge. This move does wonders for the inner and outer thighs as well as the buttocks. It can even help tone your calf muscles. As you hold the medicine ball with both hands bend your elbows and keep your arms at waist level. Take a wide stance. Then, alternate bending the left and right knees as you shift your body-weight in the direction of the knee you’re bending. You can also use the medicine ball with traditional lunges. The difference is that traditional squats do more to work your quadriceps and hamstrings. There’s one upper body move that’s simpler to do with a medicine ball than with weights. Just practice throwing the ball straight up in the air and catching it. As simple as it sounds, this move would be difficult, even dangerous, to do with dumbbells and using wrist weights or a resistance band wouldn’t give you the same results. This move tones all the upper body muscles, including the biceps, triceps, chest, back, and shoulders. Medicine balls for beginners can be a real game-changer, helping them stay motivated by producing results fast. Most calisthenics moves can be modified to make use of this novel piece of exercise equipment. Once you get to the point of creating your own workouts with medicine balls, that could be a sign that you’ve arrived at the next level in your fitness journey.